​Please specify your Golden charity of choice in the comments area. available on paper and canvas. 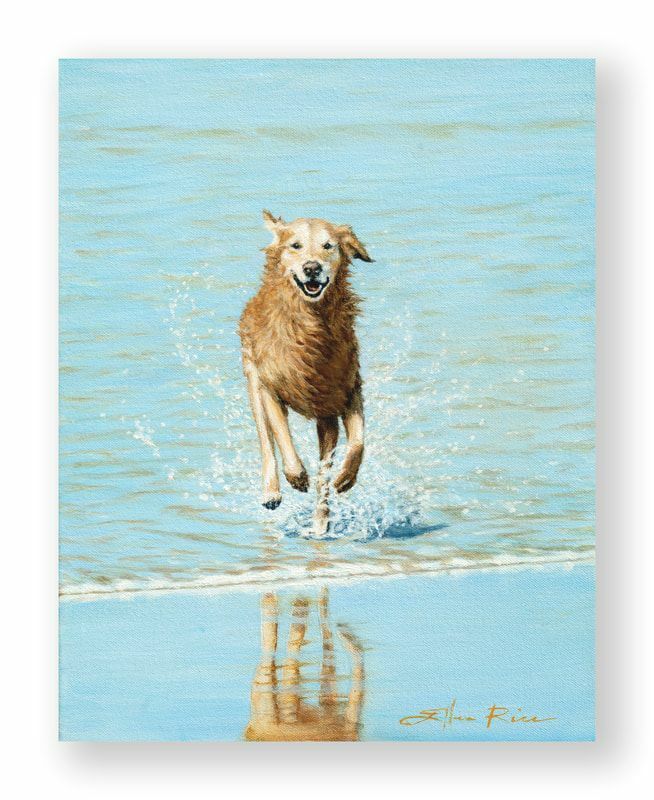 Parked on a chair close to the water's edge with my husband and our son, Jeff, I often watched this Golden Retriever enjoy the freedom of playing in the surf. He (she?) would run back and forth into the water countless times, chasing balls, sticks, chasing absolutely nothing, frolicking just for the joy of it, always running as fast as he or she could skedaddle on all fours back to its people. This happy dog was a seemingly tireless ball of salt water covered fur and always brought smiles to our faces. We saw the same dog countless times that summer, sometimes accompanied by other dogs. At some point, I may do another painting of the black lab that another family had that played with the Golden. This smiling dog was a joy to paint. I think I smiled back at him or her the whole time I painted! It was a happy time, a happy place, a very happy dog and now a very happy painting. Enjoy.